The installation entitled Shield was made during the ArtFort festival. It was positioned in the fortress of Komárom in an apse in the middle of a semicircular brick corridor. 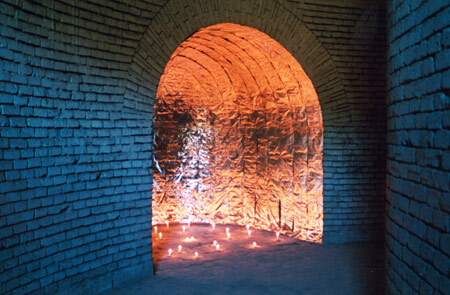 The apse was lined with aluminium foil and lit with candles. In an architectural environment radiating power, strictness and discipline, the intention was to create a different, surprising, quasi-sacral space.